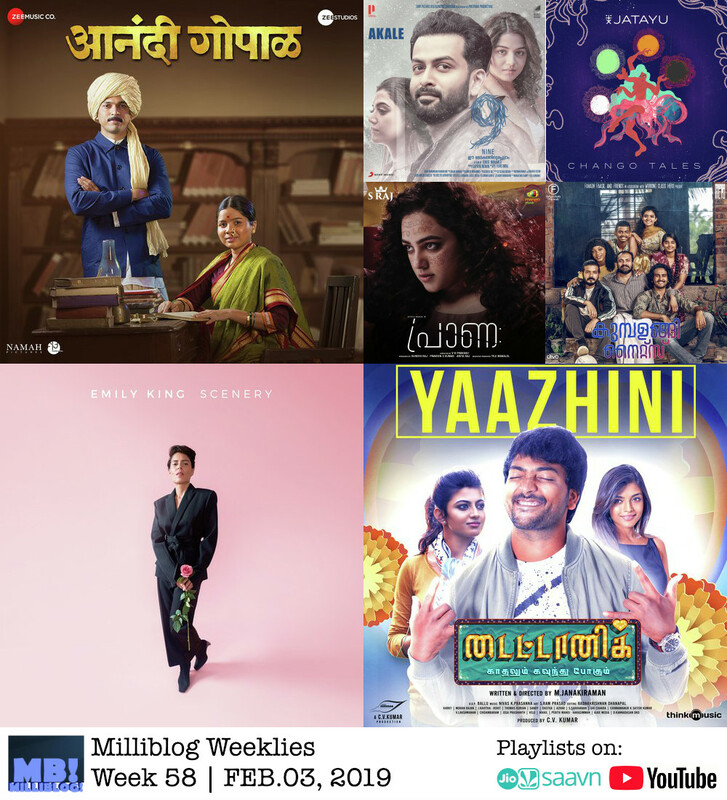 Milliblog Weeklies – FEB03.2019 by Milliblog! 16 songs this week. YouTube has 12, and is missing 1 of Emily King’s 4songs, Jatayu’s Chango, and Anand Ghana & Tu Ahes Na from Anandi Gopal. JioSaavn has fares better, with 15 songs, and is missing only Thenikkatte, from Thenkasikkattu. Yaazhini – Titanic (Nivas K Prasanna) – Tamil: Think Music released a 1-minute teaser of this song in August 2018!! After more than 6 months of a tease, here comes the full song! It’s a delightful mix of Rahman’s sensibility (think Pachai Nirame’s serene sound) and Nivas’ tune (think Thegidi). Vijay Prakash sounds quite unlike himself as the song starts, but when he goes, ‘Mudhal Thuli Engae’, you know it is him! Akale – 9 (Shaan Rahman) – Malayalam: This is the happy song before things go irrevocably awry for the couple and their child, if you have seen the trailer. The video’s Delhi backdrop, the uncredited (only on YouTube) backing vocals in Hindi by Shaan himself, the zingy tune that picks up a catchy rhythm after the serene opening, and the fantastic lead vocals by Harib Hussain (and another set of backing vocals by Anne Amie)… it all works out so darn well! Mele Kaavil – Allu Ramendran (Shaan Rahman) – Malayalam: After Aarum Kaanaathe, a highly melodic tune, Shaan cranks up the speed Ethaatha Kombaaneda and speeds up the crank with Puncture. Both don’t work as much as this other song sung with superb verve by Vineeth Srinivasan. The song’s jaunty and rhythmic beat adds to the charm. Shalabamaayi – Praana (Arunvijay) – Malayalam: More than Oru Vaakkin Mounam, composed by Louiz Banks (sung by Nithya Menen, but not too convincingly) and the title song composed by Ratheesh Vega, it’s the 3rd song by Arun Vijay, Shalabamaayi, that’s my pick of the short soundtrack! The sparkling tune is reminiscent of early Rahman, while the tabla-base sound reminded me of Vidyasagar’s music. Excellent combo, that… and in Shilpa Raj’s pleasant vocals, the melody comes out beautifully alive. 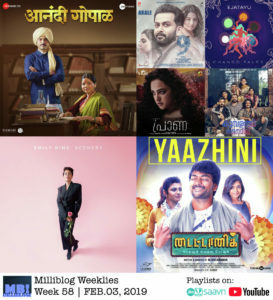 Uyiril Thodum – Kumbalangi Nights (Sushin Shyam) – Malayalam: I wasn’t that fond of the film’s first single (Cherathukal), but Sushin gets the 2nd one superbly right! This is his Maradona/Varathan form, with an enchanting tune, orchestrated in an equally hypnotic way. The pitch and tune changes in the interlude is even more interesting! Anand Ghana, Waata Waata & Tu Ahes Na – Anandi Gopal (Hrishikesh-Saurabh-Jasraj): The other composers who need to make their long-overdue move from Marathi to Hindi films (like Ajay-Atul) is the trio, Hrishikesh-Saurabh-Jasraj. Their music has been exceptionally consistent and interesting for quite some time. After Ranga Maliyela, the other songs worth a listen in the charming soundtrack include the very cute and retro Waata Waata, and the incredibly melodious Anand Ghana. Aanandi Joshi and Hrishikesh Ranade are outstanding in their rendition of the affecting song. Even in the anthemic Tu Ahes Na, the trio are an impressive form, channeling the other trio that produces music very similar to this – Shankar Ehsaan Loy! Naina – Strings Ft. Sona Mohapatra: From Strings’s upcoming album, ’30’ (from which many singles have been showcased already). The Pakistani band rope in both Amir Khusro’s verse and Sona Mohapatra to add heft to the song. The tune they use for Khusro’s Ghar Nari is based on the famous rendition by Ustad Munshi Raziuddin, but the extension and Sona’s segue into the song adds a nice new touch. On My Way – Sheppard: The song was part of the soundtrack of the 2014 film, The Giver. Now, the 6-member Australian band is showcasing this song as their entry into Eurovision 2019 – Australia Decides. The chorus’ish vocals (a bit like Coldplay) and the groovy pop vibe fo the song keeps it more than adequately likeable! Remind Me, Teach You, Can’t Hold Me & Caliche – Scenery (Emily King): Emily’s 3rd album is a delightful mix of 80s style Soul + R&B blend! While the whole album is a great listen, these 4 songs worked almost instantly for me, for their vibrant sounds and of course, Emily’s fantastic singing.